So you want to give Twilio a spin, or you’ve already signed up for your trial account and want to understand what you can and can’t do? You’re in the right place! Head on over to https://www.twilio.com/try-twilio to sign up for your free trial account. Part of the signup process includes verifying your personal phone number: this is a security measure that is mandatory before you can try Twilio. Once you finish signup, you should see your Console Dashboard. This is your home for finding your Twilio credentials, checking your usage, procuring a phone number and more. We give you a small preloaded balance to test out Twilio’s functionality. You will not be charged for Twilio phone numbers or usage until you upgrade. When you signed up for your trial account, you verified your personal phone number. You can see your list of verified phone numbers on the Verified Caller IDs page. You must verify any non-Twilio phone numbers you wish to send SMSes, MMSes, or place phone calls to while in trial mode. This is an extra security measure for trial accounts that we remove once you upgrade your account. You may verify as many phone numbers as you’d like. Click on the red plus (+) icon to add a new number. Enter the verification code. You’re now ready to text or call this number with your trial Twilio account. You will need a Twilio-enabled phone number (a phone number purchased through Twilio) to send messages or make phone calls using Twilio. 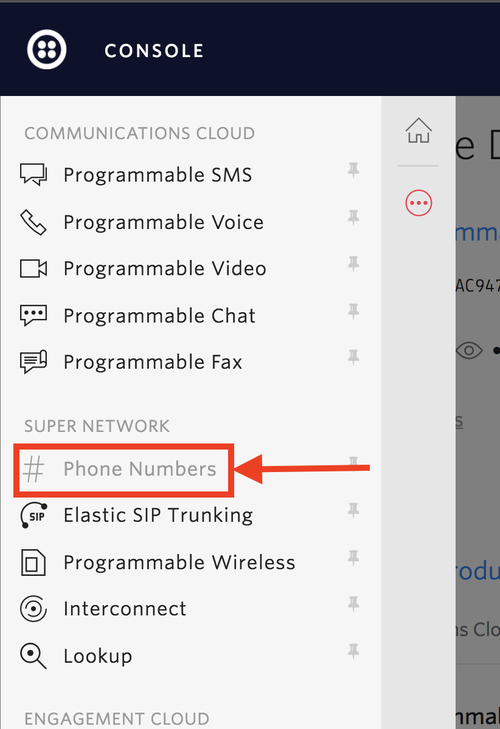 If you’re not picky about your Twilio phone number, you can let us pick your first one. After signing up for your trial account, navigate to the Phone Numbers page in your console. You’ll see the phone number that we’ve selected for you: note the phone number’s capabilities, such as Voice, SMS, and MMS. If you don’t like the number Twilio selects for you, you can search for another Twilio phone number instead. Click on the ‘Search for a different number’ link to reach the phone search interface where you can find a number that better suits your needs. You can customize country, area code, or capabilities. If you don’t use your phone number for more than 30 days, we’ll remove it from your trial project. If you decide to return, you can always pick a new phone number. If you choose to upgrade your project, your trial number will be carried over and charged monthly according to current Voice/SMS rates. Note: we only allow 1 Twilio number per trial project. If you select a number or choose your own and decide that you’d like a different phone number, you must first release your current number, then pick a new number from the Buy a Number page. Go to the Manage Numbers page. Once you’ve clicked the link, the number will be released, and you can get a new Twilio Phone number from the Buy a Number page. You will not be charged for any numbers 'purchased' during your free trial: the billing cycle for phone numbers and usage only begins once you upgrade. You may see charges on your Project Usage page: this is just to give you a feel for our pricing and your usage. You will not owe this money once you upgrade. The processes for sending messages, making phone calls, and setting up an Elastic SIP Trunk are the same on a trial account as a full paid account. However, there are some restrictions and limitations while in trial mode. Calls are limited to 10 minutes while in Trial mode. Any non-Twilio phone numbers you want to place calls to must be verified first, or the call will fail. This is a security measure required for all trial accounts. You may make international calls from your trial account: however, you only have access to GA and Beta phone numbers. Check out the limited list of countries you can make calls to while in Trial mode. Note: You cannot send SMSes from your personal phone number with Twilio, whether on a paid or trial plan. You can always send messages from Twilio numbers. When you send an SMS from your free trial phone number, it will always begin with “Sent from a Twilio trial account.” We remove this message after you upgrade. Review your SMS Geo Permissions to make sure the target country you’re sending messages to is enabled. Remember: you can only send messages to verified phone numbers when you’re in trial mode. Make sure you verify the international phone number you’re sending to in the console. If your Twilio needs expand or you need to accomplish something that isn’t available to your trial account, you’ll need to upgrade your trial account to a full paid account. All you need to do to upgrade is provide your payment information via credit card or Paypal on the billing page. You can have Twilio automatically charge you when your balance falls below a certain threshold that you set, or you can buy Twilio credits with individual payments.